We thank Mr. & Mrs. Reinford for their knowledge and use of reference material. John C. Wenger, "History of the Mennonites of the Franconia Conference", 1937, p 271. HELP OUR SOCIETY PRESERVE THE HUNSICKER HOUSE! Valentine Hunsicker was a signer of the petition that was made to form a new Township in 1725 named "Skippack and Perkiomen Township". HELP PRESERVE THE HUNSICKER HOUSE! The following information is derived from a 1911 publication titled "A Genealogical History of the Hunsicker Family" by Henry A. Hunsicker, the great-grandson of the immigrant Valentine Hunsicker. This book is primarily of the lineage of only one of Valentine's seven children, his son Henry (#6). For reference, we use the number that the book designates to each Hunsicker family member, Valentine being #1. At a time of religious persecution in the German Palatine of the Rhine river valley, an orphaned child was joined with his maternal grandfather, Valentine Klemmer. This child was Valentine Hunsicker, born in 1700 in Canton, Switzerland, a region where there was more severe persecution and deportation of Mennonites. During the early 1700's, as thousands of oppressed Mennonites were leaving their homeland for America, Klemmer decided to leave as well. In 1717, he arrived in Philadelphia with his family and grandson. They made their way into the dense forests of northern Bucks County. There they built a house of rough hewn logs, plastered with clay, as did other early settlers. Their survival depended on what they could take from wild game and by clearing land. Young Valentine worked as a laborer, chopping wood or assisting his grandfather at weaving, to help pay for the cost of his journey. About 1719, he went to Skippack with his uncle Henry Klemmer, a stone mason, to assist him as a laborer. 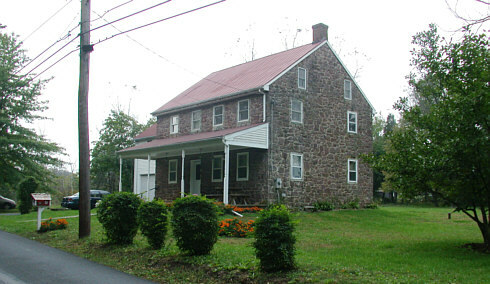 Henry Klemmer and young Valentine worked to build the second Mennonite meetinghouse in America at Skippack; the first was in Germantown, now a part of Philadelphia. Afterwards, Valentine stayed in Skippack and helped to develop and strengthen the congregation at this new meetinghouse. Later known as "Lower Skippack", this congregation would become the largest and most influential in young America. It would establish Mennonite policy and practice in the new world, as church elders had remained in Germany. The congregation later built this "new" meetinghouse across Evansburg Road in 1849. Photo taken in 2003. It is believed that the original Meetinghouse that Valentine helped to build stood across the street from the current Meetinghouse near the cemetery, on the left side of this photo. Photo taken in 2003. Valentine was industrious and resourceful, he was able to continue working as a stone mason in Skippack while saving money to purchase 125 acres of forest, paying 5 shillings per acre. He cleared the land for farming and subsequently added 100 acres. Two Hunsicker family homes remain on this land, one on Heckler Rd. and the other on Mt. Airy Rd. (east side). Hunsicker House on the east side of Mt. Airy Road. Further investigation is required to determine the original date of construction for this house. It is believed that this is an 18th century house that was rebuilt with Victorian influence in the late 1800's. after a devastating fire. Photo taken in 2003. As the farmstead and Hunsicker family grew, Valentine first built his home along Mt. Airy Rd. (east side) just south of Heckler Rd. The large stone home still stands today (6/03). Later, the Hunsicker family added a stone house on Heckler Rd. across from the school, which is further discussed below. A third Hunsicker home stands on the west side of Mt. Airy Rd. which an 1871 map shows as the residence of Valentine's great-grandson, Christian, at that time. All of these homes appear on early maps of Skippack. Hunsicker House on the west side of Mt. Airy Road. Further investigation is required to determine the original date of construction for this house. 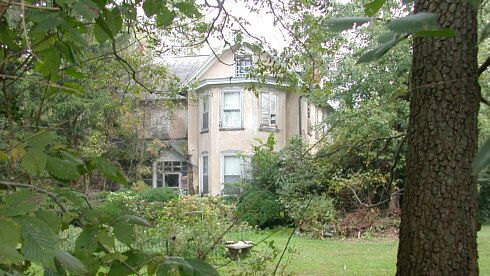 This house was occupied by Valentine's great-grandson, Christian Hunsicker (1816-1883).Photo taken in 2003. A 1756 census shows that Valentine had five children and 225 acres, 100 acres being clear. He married in 1728 to a wife of unknown name, then again in 1735 to Elizabeth Kolb daughter of Jacob Kolb who was another early settler of Skippack. He had a family of seven children. CLICK HERE TO LEARN MORE ABOUT VALENTINE HUNSICKER'S CONTRIBUTION TO THE FOUNDING OF SKIPPACK AND PERKIOMEN TOWNSHIP IN 1725. He left the farm to his young son Henry. Then, Henry left it to his son Garret who left it to his son Christian. The farm was then left to Christian's son Garret who left it to his son Henry. The farmstead belonged in the family almost 170 years. During this period, the Hunsicker family members were well involved in the church and industry of Skippack and surrounding areas. They were greatly respected, forming businesses, and holding positions in companies. Valentine's son Isaac (#3) was born September 28, 1738 and died February 23, 1828. "He was born, lived and died in Skippack, and was a farmer." 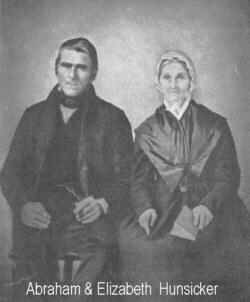 He married Barbara F. Greder (Grater) on November 5, 1761, daughter of Jacob and Mary (Friedt) Grater, and had 11 children. She was born September 21, 1740 and died January 12, 1817. (p20) Isaac (#3) "began signing the Skippack alms audits in 1764; and was the treasurer, 1785-1821", by author John C. Wenger. Isaac's (#3) youngest child was named Isaac(#4), that married Magdalena Cassel and had 8 children. (p298) Through the valuable notes of historian Abraham C. Hunsicker, we can report more information of the lineage of Isaac. His son Isaac (#4) that, although his birth date is unknown, he died on February 3, 1869 and is buried in the Lower Skippack Mennonite cemetery. On February 28, 1803, he married Magdalena, born May 12, 1780 and died May 15, 1838, daughter of Hubert and Magdalena (Johnson) Cassel. They had 8 children, 2 died young. His second wife was Ann Stauffer, widow of Henrich Stauffer, born November 27, 1780 and died June 9, 1870. A son of Isaac and Magdalena was named Isaac C. (#5), born October 3, 1819 and died December 15, 1895, buried at Lower Skippack Mennonite. Also listed as "Isaac, Jr., farmer", he married Mary Garges, born circa 1822 and died August 18, 1890. They had 5 children; 3 died young except for sons John G. (born June 4, 1850) and Henry G. Hunsicker (born February 10, 1855). Abraham C. Hunsicker indicates, Henry G., great-great-grandson of Valentine, married Elizabeth Croll. No other information is given. Most all may be buried in Lower Skippack Mennonite cemetery. The stone addition (constructed around 1845) is on the left in this photo. The brick portion of the house starts on the right after the second window from the left. 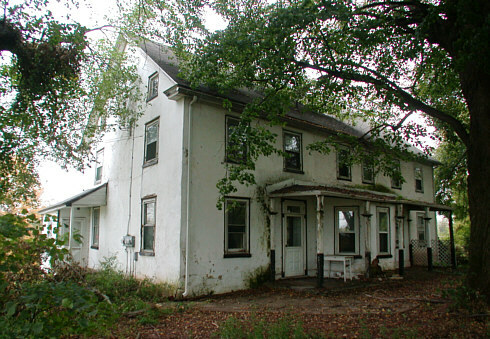 CLICK HERE TO LEARN MORE ABOUT THE HUNSICKER HOUSE ALONG HECKLER ROAD IN SKIPPACK, PENNSYLVANIA. "Ministers and Officials of the Skippack Mennonite Church" in the History of Lower Skippack Mennonite Church booklet, revised 2002, lists Isaac Hunsicker, Sr. as one of the early trustees of the church. An ordained deacon listed in 1764 is Isaac Hunsicker. Other Hunsickers are listed that undoubtedly includes the sons and grandsons of Valentine Hunsicker and his son Isaac. Deacons listed are: 1st Jacob Kolb (now the Chowns farm on Cressman Rd. ), 2nd Valentine Hunsicker 1740, 3rd Isaac Hunsicker 1764 (son of Valentine), then later, John G. Hunsicker in 1850 (great-grandson of Isaac). Valentine's son Henry (#6), born the 7th of March 1752, was a bright and determined individual, he spoke and wrote well in English and German. On December 6, 1772, he married Esther Detweiler, from an old, respectable Skippack family. They had 10 children. At the age of 30 years, Henry was ordained a Mennonite minister and soon after made the ruling Bishop of the district. His grandson remembers him as being "gifted by nature with a warm heart and a ready hand to assist, he became popular, influential, both in the church and in the community. He was much sought and consulted, being endowed with excellent common sense and good judgment. He was much employed in settling estates and appointed guardian of orphans." (p21) Henry served the ministry for 54 years. As travel was mostly on horseback, he rode side by side many times with another Bishop, Matthias Pennypacker, who was the great-grandfather of the ex-Governor of Pa. Henry died June 8, 1836 at age 85 years. He is buried aside his wife Esther at the old Lower Skippack Mennonite meetinghouse where he served so many years. Below, we cover Henry's sons: John (#7), Garret (#13), and Abraham (#16). Garret T. (#325), son of Christian (#59), inherited the farm and the old homestead where he lived and died, as a farmer. Born August 10, 1844 and died February 14, 1895. He married Maria Reiff on December 26, 1868. They had 5 children, including son Henry B. (#1133). Henry B. (#1133), son of Garret T. (#325), inherited the farmstead where he was born on June 1, 1873. He was the last Hunsicker to own the farmstead, as he sold it and moved to Philadelphia where he lived at the time this book was published. He married Minnie Swartley Kriebel on November 14, 1899, died June 30, 1912. They had one child, Mary Gwendolyn Hunsicker-Mason (#2188) of Rahns, as per the obituary of Minnie Hunsicker attached to page 252. Abraham (#16), son of Henry (#6), also became a very respected and notable citizen. Born July 31, 1793, died January 12, 1872, he married Elizabeth Alderfer, b. 11/16/1798 d. 2/15/1898. 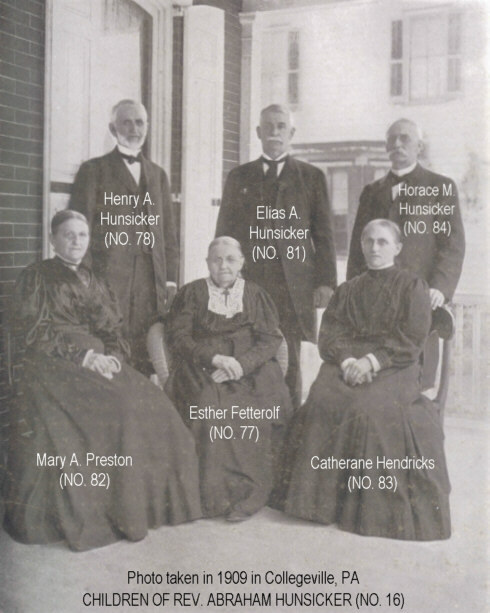 They had 10 children including the author Henry A. Hunsicker (#78). Abraham Hunsicker was a Mennonite Bishop who had more progressive thoughts than was tolerated by the Mennonite church at that time. He believed in the importance in the higher education of children beyond what they were learning in the local schoolhouse. Raised as a farmer, Abraham bought a farm in 1816 in the present borough of Collegeville. During his youth, opportunity for learning was very limited. The schools were very ordinary and mostly in German, open only during the winter months, the author writes. With these disadvantages, he persevered to acquire an education scarcely sufficient to 'read, write and cipher'. Brought in contact with the larger world, he applied himself to master the first principles of education and raised himself to a level to meet the problems of life. Realizing in himself the need of knowledge, his mind was early directed to making provision for better educational facilities for those who should come after him. Being a member of the Mennonite Church and holding such views, he encountered opposition from other members who held tenaciously to Mennonite customs and forms of the Church, and who regarded higher education as an innovation tending to the disorganization of what they held sacred. It was at the general Mennonite Conference held in Franconia, Pa., May 1846, that the "strife and foment culminated in a rupture of the church, virtually excommunicating any and all who dared opposition to the long-established usages and customs of the Mennonite Church". The break formed the Lower Skippack and the Upper Skippack Mennonite congregations. This, after the rising dissension through the 1840's among the members of the Mennonite congregation having different views in matters of discipline and church government. When about to start his cherished project to found a school, his brother Rev. John Hunsicker died in November 1847. John was the presiding Bishop of the Skippack, Providence and Methacton churches. (Their father, Rev. Henry Hunsicker, had presided as Bishop over these same churches for 54 years.) After the death of his brother John, the office of Bishop passed to Rev. Abraham. With determination, he founded and built "Freeland Seminary" in 1848, and placed his son, Henry A. (#78, author), as the principal. It was located in Collegeville. The school was designed for young men and boys, flourished beyond expectation, though it received little support or patronage from the Mennonites whom it hoped to benefit. Its non-sectarian spirit commended it to the popular support of an appreciative people. The original school buildings stand along Main St. near the SW corner at Fifth Avenue. Its success encouraged the founding of the "Pennsylvania Female College", in 1851, still standing along Rt. 29. about a half mile north of Germantown Pike, near the large brick "Powerhouse" building. 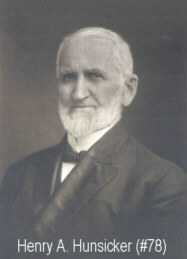 Both institutions had been most successful in raising a high educational standard in the surrounding country and beyond, thanks to the labor and foresight of Bishop Abraham Hunsicker. In 1869, he sold the school to a corporation headed by Dr. Bomberger of Philadelphia, who obtained a charter and opened Ursinus College. Compelled by the same liberal Christian principle of non-sectarianism, he built the Trinity Christian Church in 1853. He intended it to be an independent church, open to evangelical ministers of good standing and people of all and every Christian denomination, he welcomed them all. (p31) Bishop Abraham and his minister son Henry A. 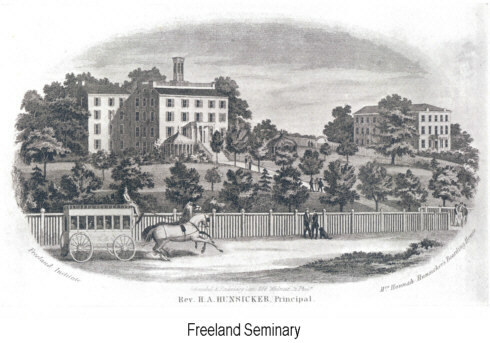 (#78), the principal of Freeland Seminary, had both left the Mennonite church sometime after the contentious feud among the Mennonites during the 1840's. They joined in the enterprise of founding the Trinity Christian Church at Collegeville. Bishop Abraham went on to establish a congregation at Skippackville and one at Rahn's Station, called Ironbridge Chapel. The Skippackville congregation began meeting at the old Literary Hall which stood in the parking lot across Rt.73 from the present Parc Bistro restaurant (6/03). The Hunsicker family was a major supporter of the 1863 construction of the Trinity Church in Skippack. CLICK HERE TO LEARN MORE ABOUT TRINITY CHRISTIAN CHURCH. The descendents of Valentine Hunsicker were involved in the community, church and industry, too many examples to list here. Reading the "Genealogy of the Hunsicker Family" will show just how active and respected the family was in their contribution to the development of Skippack area, to young America, to the Mennonites of America, and in raising education standards. This web site was designed and donated by Lederach Associates Architect + Engineers.